One of the more noteworthy developments in recent days has been the move in biotech stocks. The group attracted strong buying support in recent day that saw the iShares Nasdaq Biotechnology ETF (IBB) surged more than 4 percent last week, bringing its YTD gains up to 14.4 percent while the S&P gained 8.5 percent over the same period. Now the question is whether the rally has more legs? Below is an update look at a trade in IBB. Our “U.S. Market Trading Map” painted IBB bars in green (buy) – see area ‘A’ in the chart. Over the past few weeks. IBB has been trending lower in a short-term corrective mode after the early May rally ran out of steam near the early 2018 highs. The late July correction found support at the 10-week moving average, a key technical level. 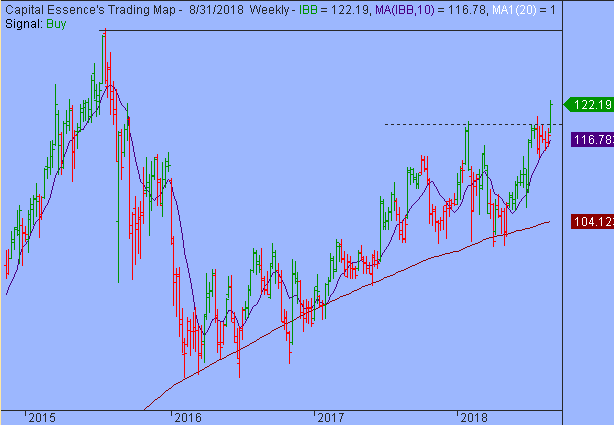 Last week’s upside breakout signify…Click here to read more.